Put the kettle on Sid! Steam Punk Rocker – Nicely sorted custom, built from a Triumph Scrambler, for racer, and former boxer, Sarah Lahalih. Created by the capable mechanic-artisan shop Garage Company owned by Los Angelean Yoshinobu Kosaka. Using a flat-track theme its low lines a reflected in the smooth grain of a wooden seat and crescent swept back handlebars. 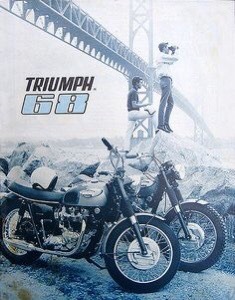 A leather clad tank, tanned to a warm complexion, with stitched “Triumph” logo emphasize the boardtrack chassis vision, supplemented with a springer fork front end. The leather strapped Pendleton wool blanket completes the look. All she needs is a South West weave covered water canteen and an adventure road from the nineteen twenties beckons. Westward Ho! Combination Lock – ready to drive around the Ring of Kerry with your partner by your side is this emerald patterned sidecar outfit a la Trident. Quite daring in its appearance but back in those days all this psychedelic were the rage. 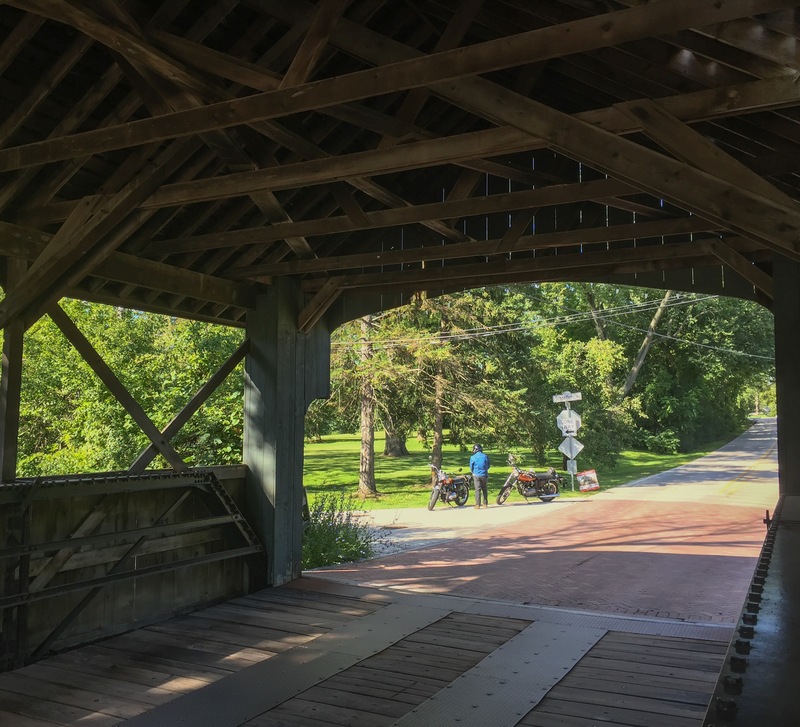 Covered Bridge – a quick stop on the ride was to see this older creek crossing located at Long Grove just off Old McHenry Road. Steel plated tire tracks and a few roofing shingles missing, I had seen better days. It is a metal half-hip pin-connected Pratt pony truss. Built in 1925. 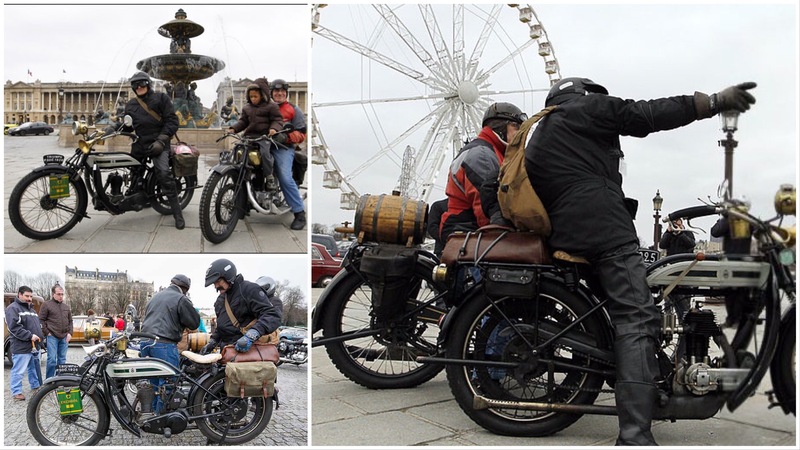 Place de la Concorde – a vintage gathering Gallic style. As well as some older Citroen, Mercedes, deux chevaux there is the odd British bike. 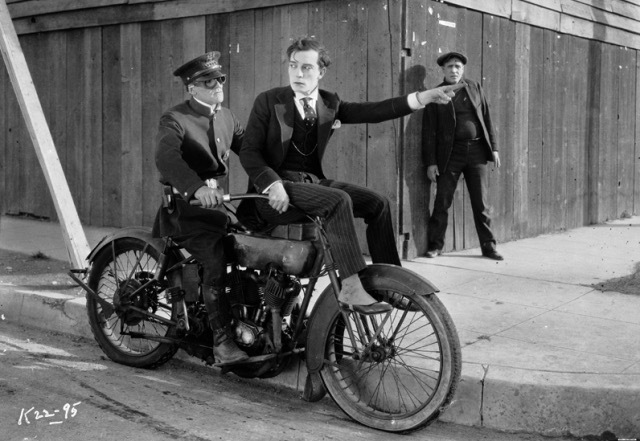 Sherlock jr. – Physical actor Buster Keaton can be regarded as one of the most revered actor directors in motion picture. His deadpan expression allowed viewers to read his emotions through pure movement. 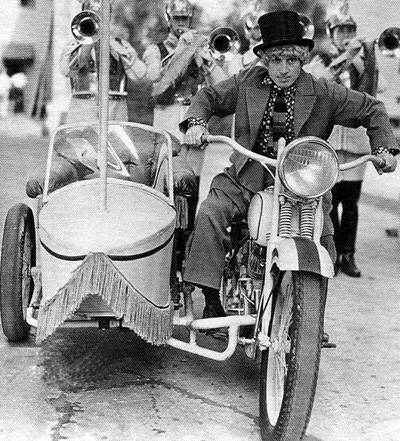 The motorcycle is a 1924 Harley Davidson JD. “Over There! 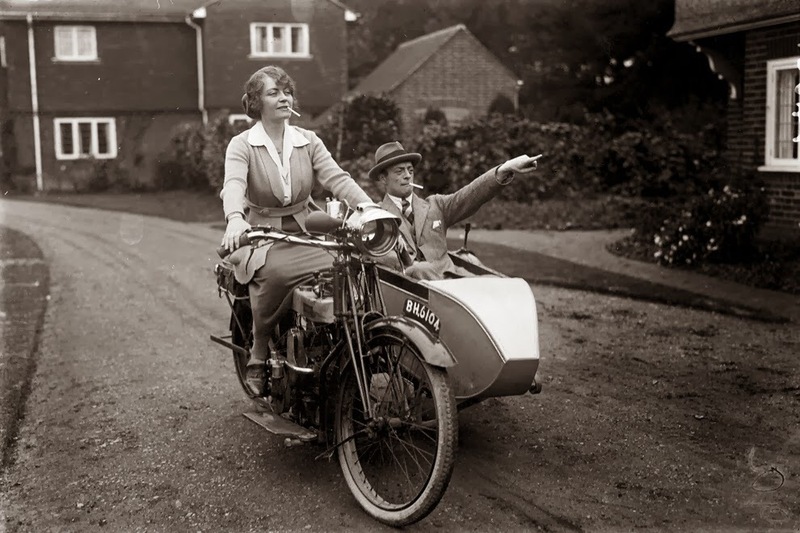 The week ahead is just around the corner!” Here’s 20’s light entertainer Leslie Henson pointing the way with wife Madge Saunders acting as driver. Outfit is a late teens Douglas. 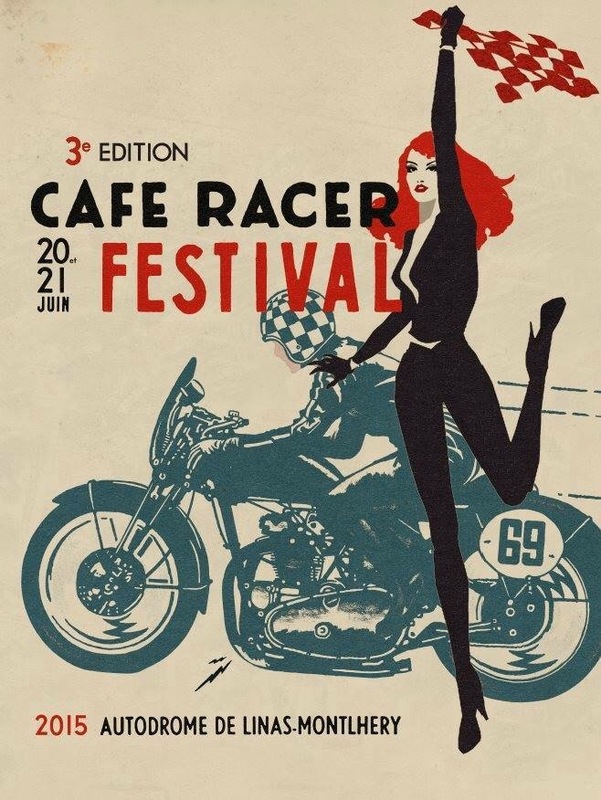 If you just so happen to be at the old banked racetrack in Montlhery France this weekend you could do a lot worse that go and see vintage racers haring around the velodrome. This years promotional poster is aptly graphic for a period event. Three color screen is just perfect! (Well a couple of other colors too) Red haired checker waver is suitably elegant. 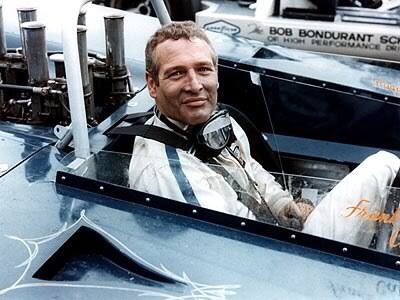 When men were men and roads were barely tarmacadam’d from the cobbled and dirt roads of yestercentury; there was a need to give some shock absorption to the steering proceedings. Otherwise anything above a running pace and the ‘bars would be whipped out of your gauntletted hands. Not Good. Unless you enjoy testing your Tweeds and cloth cap! 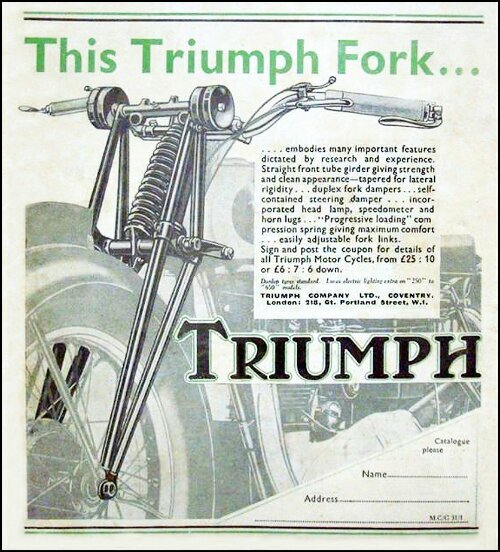 Here’s the Coventry Company’s early efforts of a girder fork. 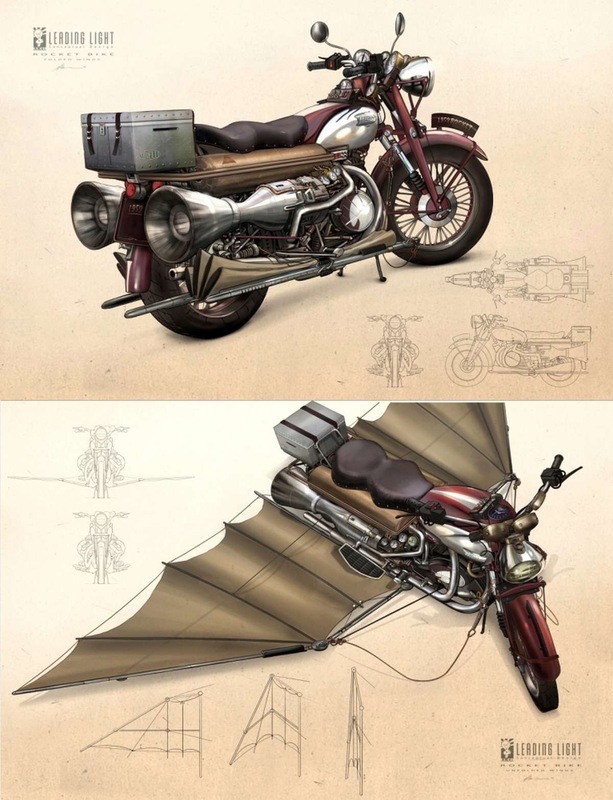 Simple action, serviceable and met the needs of the expanding moto-denizens. Indeed Phil Vincent used this system on the classically sublime Vincent over its lifetime of much sought after models. 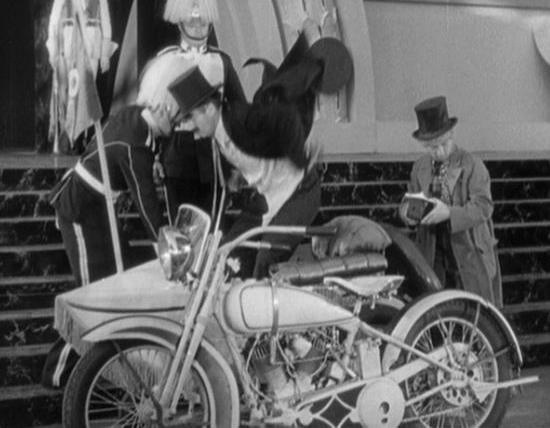 The Freedonia ruler in ‘Duck Soup’ along with the small kingdoms agent provocateurs Pinky and Chicolini use a ’26 Harley Davidson JS outfit to get about from escapade to escapade. 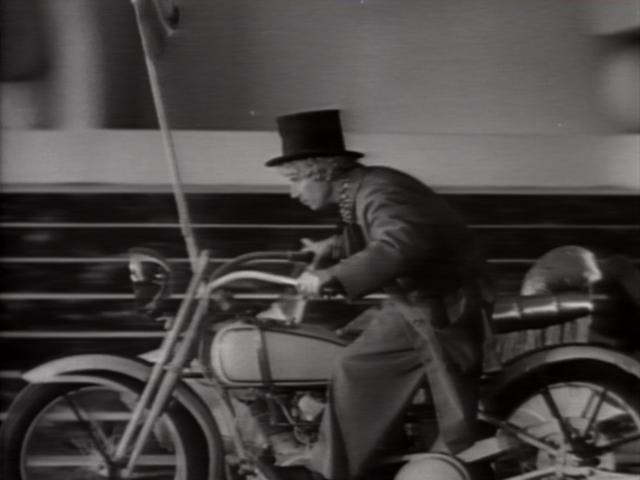 These three are of course Groucho, Chico and Harpo – as well as straight man Zeppo. The silent one taking the reins of this ride. I came to say, I must be going.